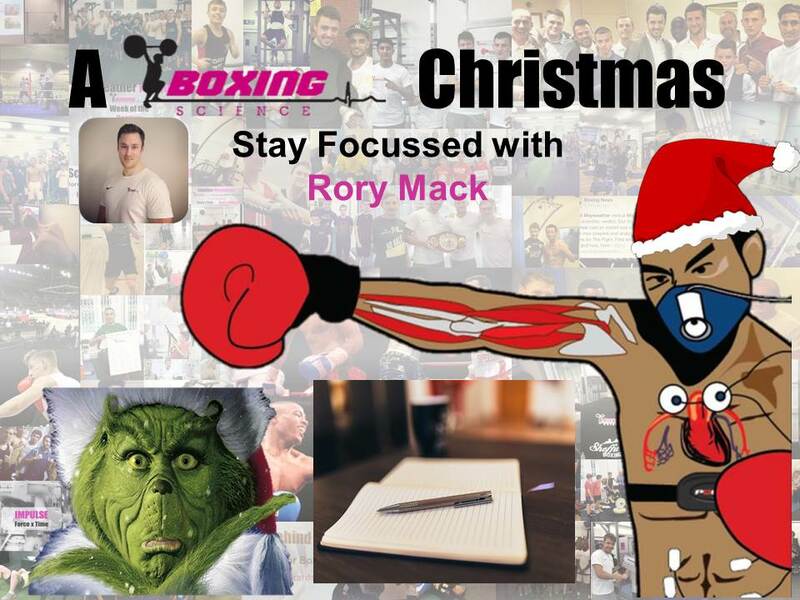 Articles A Boxing Science Christmas: Stay Focussed! A Boxing Science Christmas: Stay Focussed! Christmas is upon us once again, and it seems to start earlier every year, not just the peeling of sprouts and Christmas music in the supermarket, but also a dip in productivity and ‘winding down’ at work and in the gym. This time of year must be a boxer’s worst nightmare, given that it’s geared around food, alcohol and rest. It can become increasingly difficult to keep up the motivation for something when it seems that everyone around you is watching boxsets and eating leftovers in their onesies. The weather is really turning, and the gym is probably closed. We have heard from Mayur and Danny about what to do and how to do it, so now we have the tools for a less damaging festive period. So here we present some tips for staying focused and motivated over the Christmas and New Year period, to help you hit the ground running in January. Motivation can really take a hit at this time of year, because it’s based on how you feel about something at any given time (e.g., going for a run in the rain and the dark at 6am). But ask yourself, ‘what am I committed to?’ What is the long term plan? What is the outcome goal that you’re working towards? Keep a reminder of this somewhere you can see it every day. Commitment to something stable is what gets you through the hard times of a dip in motivation. Now that you’re clear on what you’re working towards, what are the daily goals you need to be ticking off in order to achieve this? Remember we focus on the daily processes that put us in the best position possible to achieve our outcome. Of that list of daily goals, start with the most important one each day. It’s easy to procrastinate and do the easy stuff first, thinking you’ll get to the important one later. Get that one ticked off early, and feel productive for the rest of your day. Let’s be realistic and honest up front here: you’re going to be taking time off, eating and drinking things you normally wouldn’t, training less and staying up later than usual. It’s the nature of this time of year, and much of this is out of your control. So firstly, let’s not beat ourselves up for not robotically sticking to our normal regimes. So, factor breaks, and even complete days off, into your Christmas and New Year schedule, and plan your training around that. This way you won’t feel like you’re missing out on something, while not completely taking your eye off the target. Set a return to training day. Time off can easily snowball (pun intended) on you if you allow it to; so when you’re thinking about the time you might take off, set yourself a definite restart date, so you don’t take off more than you meant to. Maybe coincide it with the re-opening of the gym, and maybe arrange to train with someone else, to create a ‘social contract’ with each other. Work hard, play hard, and have a great Christmas and New Year. Rory is a sport and exercise psychologist in training, and current PhD student at Sheffield Hallam University. I have experience working in both sport and exercise settings, and as a lifestyle advisor. His main areas of interest include athlete well-being and the ‘therapeutic alliance’, maximising sport performance and facilitating pro-health behaviour change. Rory has worked in over 15 sports since graduating from my Masters degree, but has a particular interest in combat sports. I find the psychology of combat sports fascinating, because these provide an arena to test the limits of physical and mental functioning, and of what it means to be human – drive, fear, resilience, self-sacrifice, and instincts. Combat sports, particularly boxing, offer contests than can be decided in a split second. It is crucial therefore that when your split second chance arrives, you are ready to take it. As an athlete, Rory played county level rugby and squash, and was an international volleyball player, representing Northern Ireland at junior and senior levels, and playing in Junior College in the USA. I then transferred to strength sports, competing in powerlifting and Olympic weightlifting at university level, and currently competing as an amateur strongman. This requires lifting big rocks and pulling vans – just your everyday activities. Rory will be discussing anxiety control, preparation and confidence in his Boxing Science – Sport Psychology articles.